Microgaming a famous online slot and casino games provider is constantly evolving and growing giving its many players a lot of new games and slots unlike any other provider. Microgaming has in fact made it its mission to provide its patron the very best. In lieu of this goal, they signed a partnership with Switch Studios to bring table game players something more fun and exciting. They are now all set to release a unique modern table game into the market. The brand-new Roulette game has finally been released, and players all around the world can enjoy a classy take on this good ole’ classic game. The game has been developed by Switch Studios for Microgamming. The game will be the very first in an array of table games from the company and will ensure players get to enjoy an ultimate roulette experience online from the comfort of their homes. 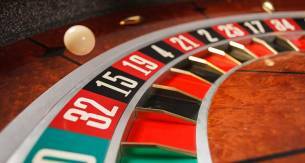 The incredibly stunning and realistic 3D roulette wheel on this game will come to life. The game has been designed with a contemporary and slick design with a very user friendly yet sophisticated interface. The game runs well on mobile devices as well as desktop devices. This means you can play this game just about anywhere and at any time. In order to increase the game’s performance, it has been built on a brand new game engine which brings players a bunch of new extras. This includes a number of special bets, race track betting features and many more favorites. Its superior sound and modern style will make this game come to life on your hand-held device! Aside from a very stunning and bright design and many exciting features, the game also allows you to view your betting information and spin result history. Players also get access to an alternative bet board layout and several betting options when they use the race track feature. By using favorites features, players get to enjoy a simple betting procedure wherein you get to save all your preferred bets to be used on a range of pre-selected bets. This saves plenty of time that can be used to take more spins on the wheel. This one of its kind roulette table game with cutting edge design and mind-blowing sound can now be played at any Microgaming powered online casinos. The game hit the casinos of 27th March and is ready to be explored. David Reynolds, the games publisher at Microgaming said the entire team is incredibly proud to be in association with Switch Studios. The latter according to Reynolds is working on bringing innovation to the online table gaming sector. This is the first classic game that has a realistic 3D roulette wheel, interesting bet options and features that make it a wonderful addition to Microgaming’s portfolio of games. The Head of Studio at Switch Studios, Tom David, also added that team is very excited about unveiling their very first official game release.